A downtown Boise project received taxpayer funds to build new housing units. Now, part of the project is being used for hotel-style rentals instead. LocalConstruct of Los Angeles opened The Fowler at 5th St. and Broad St. in 2018. The City of Boise paid LocalConstruct $159,000 as part of its Downtown Boise housing incentive program. It got $1,000 for each of the 159 apartment units in the building. The money came in the form of reimbursement for fees paid to the city by LocalConstruct. Instead of housing, dozens of the units are operating as part of short-term rental business Stay Alfred. The Spokane-based company positions its properties between a hotel offering and Airbnb. 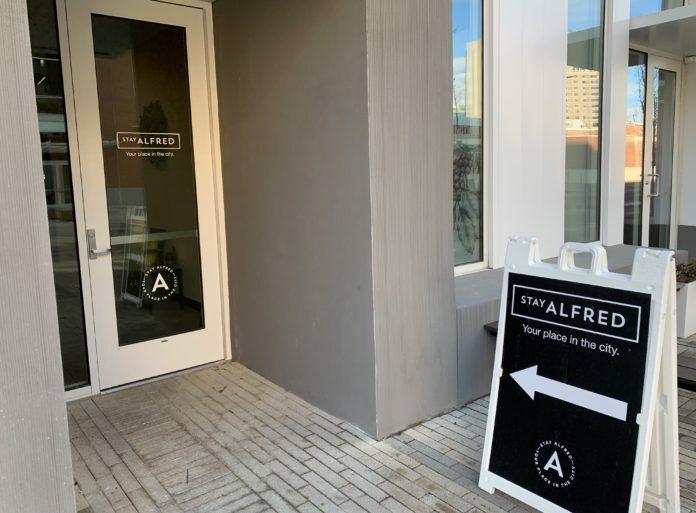 “You’re no longer satisfied with that cramped hotel or the packed full of other people’s stuff stuffiness of a typical vacation rental,” is Stay Alfred’s marketing description of its offering. Stay Alfred has 30 units available in the building, or about 18% of the overall inventory. Signage on the building points Stay Alfred guests to a dedicated lobby set aside for check-in. The hotel-like atmosphere pushed residents Lisa McGrath and Paul Carew to move out. The pair owns three businesses downtown and liked the idea of an “apartment community,” close to work. Your support helps BoiseDev’s independent journalism. Consider a membership today and get our daily email with stories like this one before the general public. Stay Alfred says it has 30 units available in the building for short term stays. That means $30,000 in taxpayer dollars earmarked to boost housing is instead being used for a hotel-type service. McGrath says her issue goes beyond the issues they experienced as residents. “Why did the City of Boise pay housing incentives earmarked for residential housing to a company that converted numerous units into glorified Airbnbs,” she asked. City of Boise Director of Communications Mike Journee said this isn’t what the city intended the incentive for. The city already ended this version of the housing incentive program but is working on a new version. “Going forward now we’ll make sure that as we expand that program as part of Grow Our Housing that it spells out very clearly what developers can and cannot use that money to build,” he said. McGrath said she contacted building management with her concerns. We asked LocalConstruct to answer questions about the arrangement. They instead provided a prepared statement. Clarification: LocalConstruct was given a reimbursement for $159,000 in fees it paid for the project. These dollars came from the city’s general fund. Disclosure: McGrath & Carew are on the BoiseDev Board of Advisors. They do not have a say in editorial matters.